P.S. Is that an awesome poster or what, it just gives the movie an epic overtone, while still showing how dark and twisted the film is. Disney, it’s a name kids know all too well. We all grew up with those terrific movies at a young age and every Disney film seems to be labeled a classic. Well, some are remembered more than other’s and through the 70’s and 80’s we were given a lot of Disney movies that are more and more forgotten. 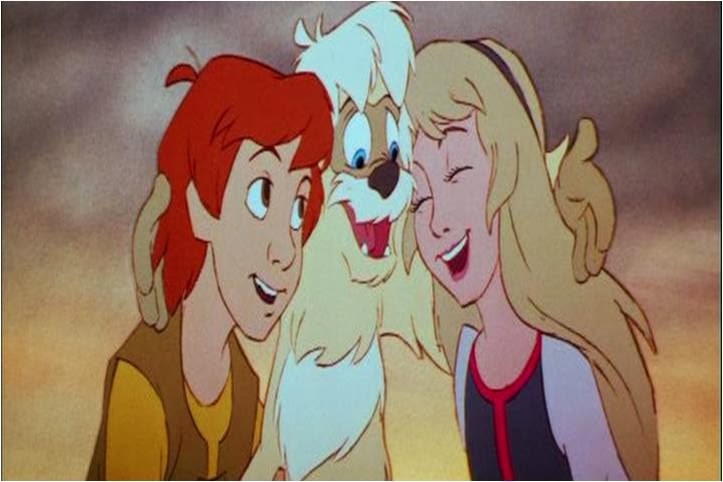 The one Disney movie that gets snubbed more than any other animated classic is the 1985 motion picture Disney's “The Black Cauldron”. Never heard of it, well then it’s time to give it mention. 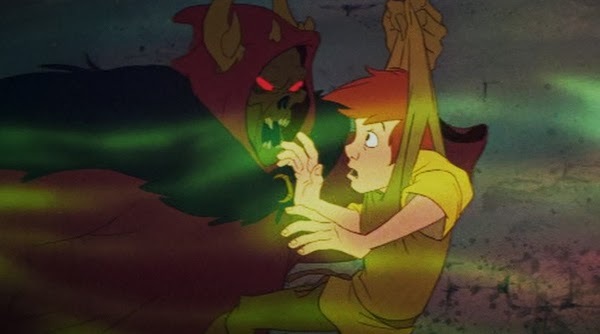 "The Black Cauldron" is loosely based on the dark series of books called "The Chronicles of Prydain" by “Lloyd Alexander”. There are six Chronicles that began in 1964, I haven’t read them but they must have been interesting enough for Disney studios to make a movie based off the series. This is Disney’s 25th theatrical animated feature film and one that I find to be rather underrated. While it’s never been labeled a classic, it has become a cult favorite, so it has its fans out there. The plot is very similar to “Lord of the Rings”, it’s all about a young boy who’s burdened with a mission to destroy a weapon of terrible power, in the case of this film, the black Caldron. This weapon was forged in darkness and a dark lord wants to gain this Caldron to use it in a plot to dominate the kingdom. The main character is a young boy named Taren, an assistant pig keeper, who dreams of becoming something important, like a great warrior. Typical lead character, I know, and my feelings towed him are very mixed. On the one hand, I like how he’s not a perfect “good” character, in fact he’s selfish and a little arrogant, then he goes on a learning journey and becomes a better person in the end. I especially love how no one really teaches him anything, he makes the change all on his own, that is an awesome concept that's pulled off very well. However, his boasting about being a great hero can get really annoying at times, especially in the first half of the movie because he just never shuts up. Despite being annoying at times, I do think it’s necessary for his character development, by viewing him as a selfish jerk in the beginning, it makes his self realization at the end all the more powerful. Like any classic fantasy adventure, Taren makes some good friends along the journey, and they all become allies in his quest to destroy the Cauldron. Again, it’s nothing new but there’s something about this particular group that I really like, mainly because there the complete opposite of other groups like “The Fellowship of the ring”, from “Lord of the Rings”. That group was specifically sent to destroy the ring and was more fit to do so, that team had a wizard, cook, guide, and 4 experienced warriors. This is a team of 4 strangers who have no experience of going on a journey like this, are extremely vulnerable, and probably shouldn't be doing anything like this. However, their growing situation is constantly forcing them to be the ones to carry out this mission and I absolutely love that premise. The characters themselves are fairly decent, certainly not some of the best supporting characters in Disney's line up, but there still likable, and they definitely have their own charms. The comedic relief of the film is a fun loving creature named Gurgi, I’m not sure what he is but he looks like an albino Ewok or something from a “Star Wars” cartoon. While he can be a little annoying, he isn't as stupid as some of the other comedic reliefs I've seen. The one saving grace about Gurgi is that he'll do something at the end of the film that is surprisingly touching and one of the big highlights of the movie. There’s also a cute little side character named Henwen, who's a pig with a special power to create visions. The animation on these vision scenes are really impressive. 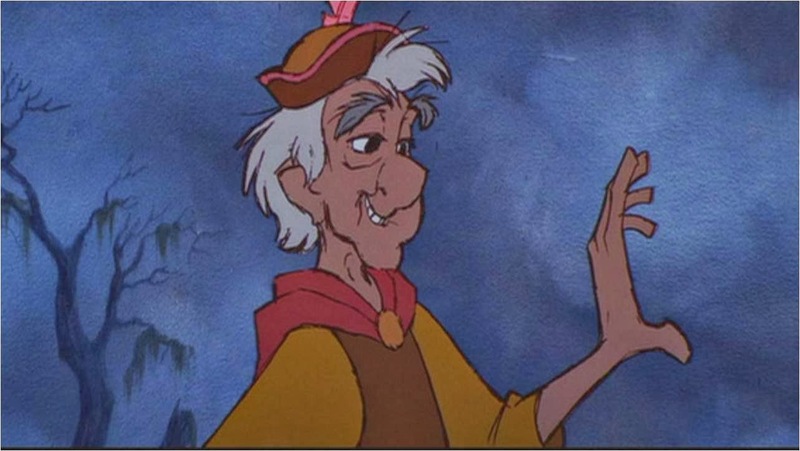 Then there’s an old man named Fflewddur (good luck pronouncing that name) who is a broken down minstrel. Usually I hate when old people go on adventures, they just seem to get in the way, but this was a character that could hold his own and was actually fun to have on screen. 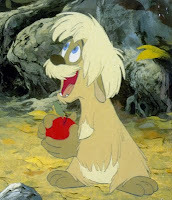 He’s voiced by the late Nigel Hawthorne, who would latter provide the voice for “Professor Porter” from Disney's 1999 animated classic “Tarzan”. 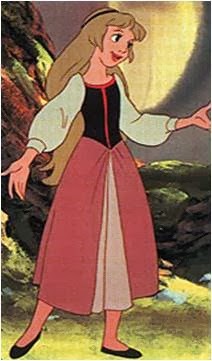 At last, we have our Disney Princess named Eilonwy, not a very popular Disney Princess but much like the movie, I find her to be rather special in her own small way. Personally, I think she has the cutest voice of any animated Disney Princes and she has a nice personality to boot. She's sweet, polite, but can also stand up for herself in a heated argument. Her design is also very simple, she doesn't dress like a princess, at least, not as elegant as any of the classic Disney Princesses, which is slightly refreshing. 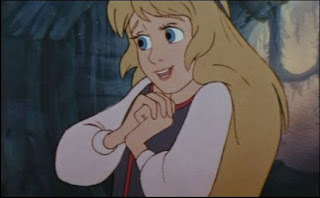 Eilonwy's also followed around by a glowing yellow bubble that looks like it belongs in a Legend of Zelda video game. Now I have to admit, there's really no point to have this character in the film at all because she contributes very little to the overall plot and is only slightly active. Then again, it’s just more fun to have a sweet girl character come along for an adventure like this. There's a little relation between her and Taren that's nothing special but their social interactions are simple and genuinely sweet. The villain in this film is one of the Darkest that have ever come from Disney and personally one of my favorites. He has no real name but he’s always addressed as The Horned King. I don’t think there’s ever been a Disney villain this frightening, this evil or this dark, and it makes him kind of cool in his own right. 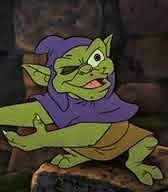 Sure, there have been sinister Disney villains ranging from Maleficent in Disney's Sleeping Beauty to Jafar from Disney's Aladdin, but they always had a humorous, more kid friendly persona. The Horned King is different, there's nothing light or simplistic to balance out is sinister presence, he's just evil right to the core and the stuff of nightmares for children. He isn’t loud, he doesn’t emote, he doesn’t have a fun sense of hummer, instead he’s calm, quiet and kept in mystery. We’re never given an explanation as to why he’s a living corps with no soul but that’s what makes him so interesting. The more mystery there is to the villain, the more sinister they seem. He may not be flat out terrifying for all viewers but there is something genuinely cryptic about his overall appearance. After all, this is a film with knights and such, so you would expect the Horned King to be some large warrior or wizard with human features. It was quite a shock when he appeared to be some sort of zombie sorcerer and for the record, he makes one of the coolest first appearance any villain has ever made in a film. The Horned King is voiced by the always fantastic John Hurt who brings the character to life with menace and a very sinister voice. Unfortunately, like most Disney villains he has an annoying little henchman called “The Creeper”. 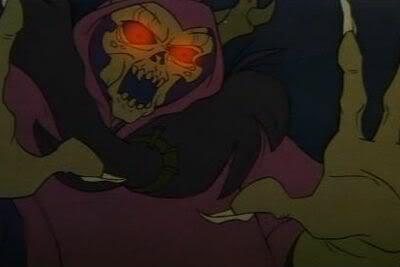 To his credit, he’s not as annoying as some of the other evil Disney henchmen, Creeper was only mildly annoying and he doesn’t even come close to ruining the exciting presence of The Horned King. Now what's really annoying in this film is a group of witches that use dark magic to turn people into frogs. While there an important contribution to the plot, the're still extremely annoying and arguably the weakest part of the film. For it's dark overtones and especially scary villain, the movie was a big bomb at the box office. 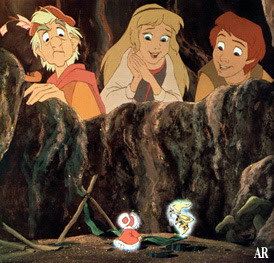 I can understand why, in fact, this was the only Disney film that my parents restricted me from watching as a child. 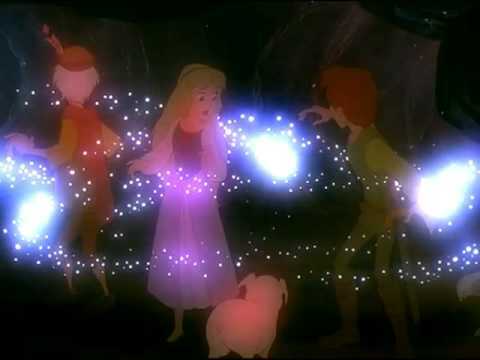 Upon visiting Disney world in Florida, I couldn’t find a single reference or item related to "The Black Cauldron" anywhere, not even a clip in the show “Fantasmic”. Heck, I own Disney Trivia and Charades, and neither of these games have a reference to this movie, but every other Disney film is there. Well, the film nearly shut the Disney studio down for good and the company has never been that fond of it. Personally, I don't think this movie is shunned or ignored for being a bad movie, the problem is that it’s far darker and more sinister than any other Disney film. Of cores the demonic looking villain scared kids but there’s more of a wicked feeling that falls in the films premise. 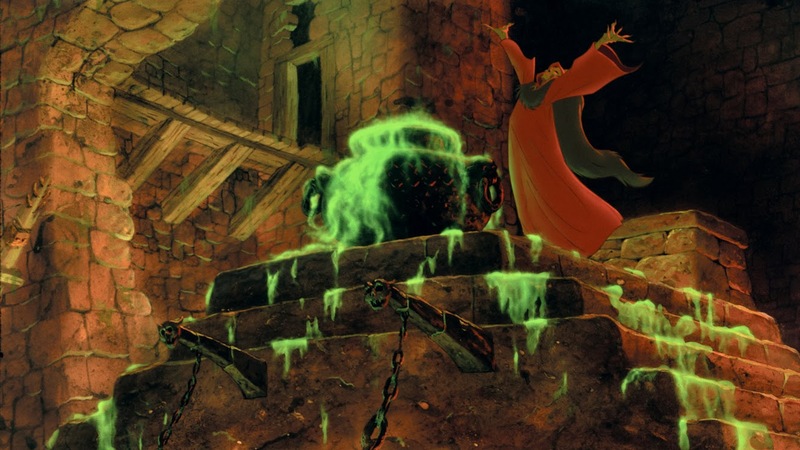 Right from the opening, we learn the origin of the cauldron, how it holds the soul of the most evil ruler who ever existed, anyone who obtains it will be able to harness its evil and awaken vast armies of dead worriers, pretty extreme. There's especially harsh moments when characters get beaten, bruised and even bleed. Most Disney movies submerse us in really magical and colorful worlds, but throughout this whole movie, we get images of corpses, skulls and all kinds of dark detailed images. The scene that sums up how dark this film is in a nut shell is at the end when the Cauldrons power is unleashed and we see the army of dead solders come to life, it’s awesome. Perhaps it’s best not to compare this to the other Disney movies, because it’s nothing like them. It doesn’t have that same magical charm of something like “Beauty in the Beast” or “Sleeping Beauty”. Even the settings aren’t that pleasant, most of it takes place in swamps, darkly lit forests and very dirty interiors of an old castle. 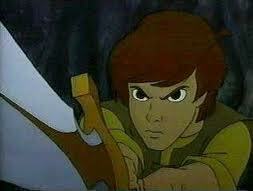 This isn’t a complaint by any means, I’m the kind of guy who actually enjoys dark animated medieval films. It’s just best to go into this movie with the mind set you’d have before watching something like Ralph Bakshi’s animated “Lord of the Rings” movie or Martin Rosen’s “Watership Down”. This was also the very first Disney movie to feature zero songs, the only other animated Disney classic to have no songs is the 1990 Disney film “The Rescuers Down Under”. Admittedly, as much as I love Disney songs, I can’t imagine any of these characters singing. But the musical score composed by the great Elmer Bernstein is fantastic, sounding grand and dark at times, while in other scenes it's subjecting you to that magical, medieval environment. Bernstein just came off the success of his Oscar-nominated score for the 1983 film "Trading Places" as well as his terrific score for the 1984 film "Ghostbusters", which has similar instrumentation. The Climax is also something of a mixed bag, on the one hand we have a surprisingly touching scene involving one of our hero's making a noble sacrifice, however, I feel like the conflicts in this finally get resolved a little to quickly. Or let me put it this way, the movie really builds up the resurrection of this army of dead soldiers, and it's awesome when they come to life, but they get defeated so quickly that you just wish there was a little more payoff, or maybe even a cool battle scene. However, this finally still has some strong highlights, and we do get an exciting sequence of our hero's destroying the Cauldron and escaping a crumbling castle. For all the negative in this film, there is still more than enough good in it to balance out all the darkness. There's some great morals on sacrifice, and how giving up your life or dreams for greater good is the most heroic act you could ever make. The animation and visuals are amazing spectacles to look at. Ranging from bright and colorful to dark and abstract. The backgrounds are richly textured and detailed, you can really lose yourself in all these illustrations. It also has a rich fairy tale atmosphere, with all kinds of magical characters, like a society of sprits that live under a lake, there's also Dragons, witches and all kinds of great fantasy elements. I especially love the end credits, with all these detailed illustrations and pictures in the background, which allow you to reflect on the adventure you experienced with the characters, more movies need credits like this. Overall, this film is a fun, dark ride that’s ambitious, has decent morals, likable characters and is technically brilliant. 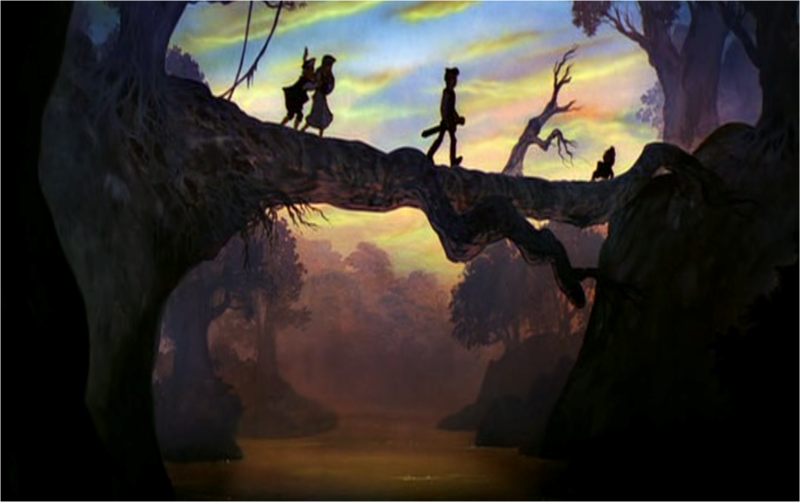 It certainly isn't one of the absolute best to come from the studio, nor is it a classic like “Cinderella” and even “The Lion king” but I still like it a lot, just for different reasons. 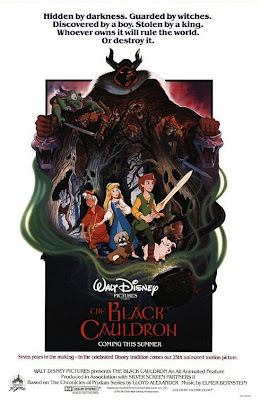 I'll admit, the film has some announces and it certainly isn't something that will win a huge crowd of fans but still, "The Black Cauldron" is an underrated gem that deserves more attention then what it has gotten, because I think it's a good entry in the Disney collection. 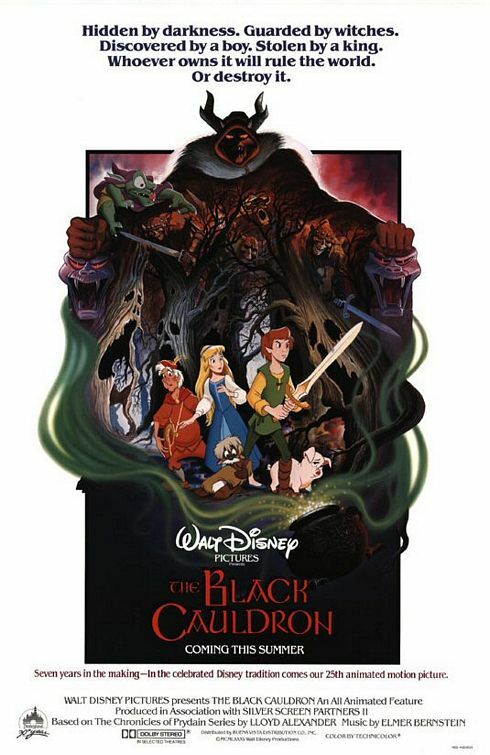 I give “The Black Cauldron” 3½ stars out of 5.